Titan Computer Co., Ltd, today released the TTC-G5T, which is a notebook cooling pad incorporating 2 USB digital speakers, and with expanding mechanism, it’s compatible with most notebooks. By lifting up your notebook, the TTC-G5T is able to improve airflow for your notebook, so that hot and cool air can be exchanged quickly to reduce the heat trapped between your notebook and the desk to keep your hard-working notebook cool. The TTC-G5T cooling pad speakers are USB-based speakers, which are fully digital, reproducing sound quality that exceeds the quality of notebook built-in speakers and surpasses the analog limitations. For those who require better audio from your notebooks while on the road, the TTC-G5T may be the option you need. It’s powered and receives audio via a single USB connection, which makes connections simple and neat. The TTC-G5T has 2 functions. 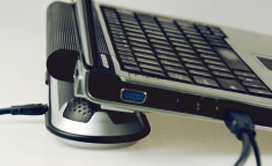 It can be used as a notebook cooling pad with speakers or standalone as portable speakers. Also, there are 2 USB connections on the TTC-G5T, which are specially designed for the above functions, depending on which way you will use. In addition, the blister package comes with a carry pouch, which allows you to keep the cooling pad speakers. 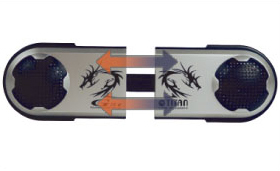 If you are looking for a notebook cooling pad with good quality speakers, Titan TTC-G5T will be a great choice!